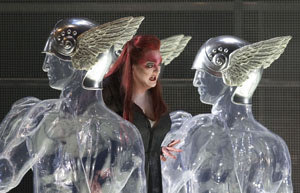 It is now well confirmed that any reprise of the enormously succesful Adelaide 2004 Ring Cycle has been shelved. Why? Apparenly after three feasibility studies, the Federal Government has decided against giving its share of the $15 million project. As Barry Humphries, a man with insight best described as piercing, noted in his inaugural Arthur Boyd Lecture in London, there are things that remind you that our Prime Minister is from Queensland. Add this to the list. As for Peter Garrett, the Minister for the Environment, Heritage and the Arts, I can’t think where to start, and it appears neither can he. Australian soprano Lisa Gasteen joins the Adelaide Symphony Orchestra to perform works by Wagner and Richard Strauss. The problem with the ‘best bits’ is that they’re no longer the best bits when they’re not part of the whole. They’re now just bits, extracted, as if jewels from some crown, and reduced to mere familiar moments devoid of meaning or perspective. It’s like flying to Uluru or to Broome. You may think you see and understand, but what you don’t know is exactly where they (and you) are, and more importantly, why they (and you) are really there. So it is with the likes of Wagner and Strauss. Without the where and the why, all that is left is a musical vagrancy, most often disguised with the suspicious ‘gala’ tag. Nonetheless, the concert was enjoyable. The Adelaide Symphony Orchestra was in fine form. They are seasoned Wagnerian players, as well documented in the Melba recording of the fated 2004 Ring, and were in good hands with Mr Volmer. Lisa Gasteen sounded particularly warm in the middle and lower voice, and even the upper voice, if a little stretched in the first half, had some of its steel polished off. It may be the Festival Theatre, with its LARS acoustics, giving a softened warm sound. But there is a big vibrato, tolerable in its warmth, although I was even starting to wonder if a vibrato could ever end up a trill. The interval feature included an interview with Arvo Volmer nicely batting a few rather gauche questions. He made good mention of the need for piano and forte to extend beyond pure dynamics and embrace the character of the sound. Then came a musical treasure: Richard Strauss playing his own reduced scoring for the Salome Dance of the Seven Veils, recorded in Leipzig in 1906 on a Welte-Mignon piano roll, a digital invention of the early 1900s that managed to reproduce the sounds of the piano with remarkable realism. It was nothing if not astounding, for the depth of character and quality of the sound, the template for how the composer heard this music, and last but not least, it was Himself. My order is in the (e)mail. Opera is already the most subsidized of the arts. Are you seriously suggesting it should be more subsidized still? Opera is also arguably the most elitist of the arts; narrow in its appeal, extremely expensive to produce and draws its audience predominantly from the social well-to-do. And if Opera is elite then Wagner must be considered more so. And the Ring Cycle? Surely this stands at the pinnacle of cultural elitism. I cannot agree with you; let the rich subsidize "their" arts directly and not steal funding from the other arts that have a broader appeal and are less extravagant to produce. Thanks Patrick. This is worthy of more than a comment box, but for the moment I’ll focus on the specific case in question. The Adelaide Ring is a particular case with more to it than meets the eye, or ear. It arose from a wish by South Australia and Adelaide to find a global draw card to replace the loss of the F1 Grand Prix to Melbourne (which cost Victorians $40M for this years race). At stake were international recognition, national pride, and tourist dollars. 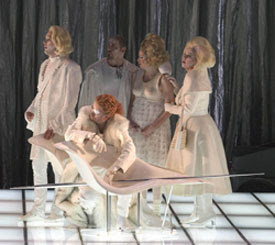 They chose to stage Wagner’s Ring Cycle with a bought production from Chatelet (Paris) in 2000, with as many locals as artistically possible. It was so successful for them that they went on to deliver the first ever wholly Australian production, lock, stock and fire, of this mighty work in 2004. It was a triumph. That this (only) antiopdean interpretation of the most significant commentary on ‘man-and-his-planet’ that I know is rotting away, while the rest of the world is using this same work for both cultural and economic success, is a tragedy. Each to his own prism.